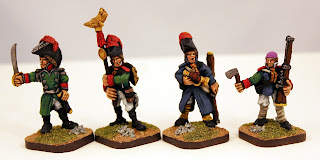 Welcome to Alternative Armies release for the Flintloque and Slaughterloo game systems for January 2019. 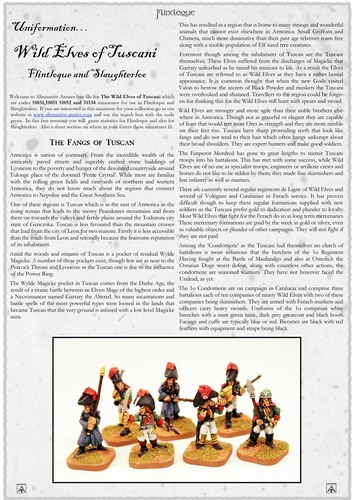 Following up on July last year when we put the original and new line infantry Wild Elves online we are delighted to reveal the second full unit pack of Tuscani Elves who fight for the Emperor Mordred. 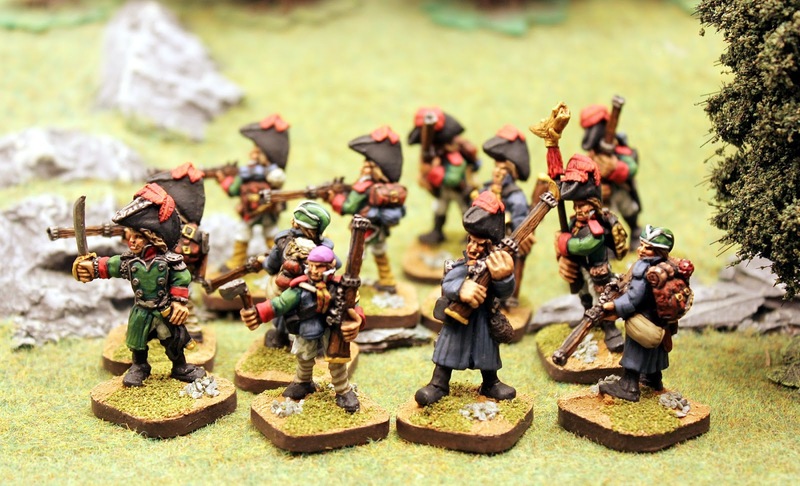 This time the skirmishers who are elite troops and make use of some ruddy big guns! Despite a bitter enmity with the Carabiniers of the Grande Armee the skirmishers of the Wild Elves may in fact just be a little better than those elite Armoricans. Sought after by Marshals in Catalucia to hunt down Cacadores and Rifleorcs they are very good troops. 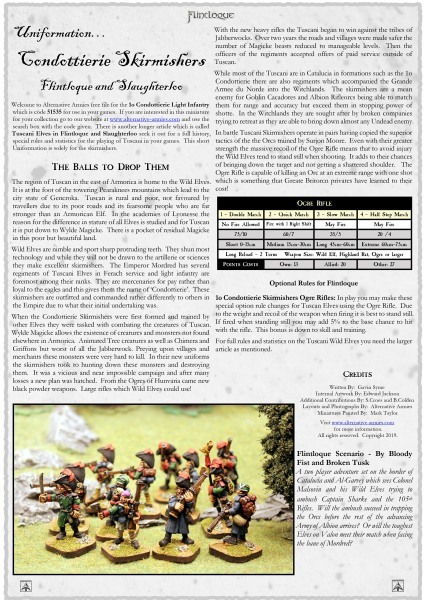 They are Light Infantry and make use of Ogre Rifles. This set of miniatures in 28mm white metal gives you twelve Wild Elves a whole unit of light infantry. 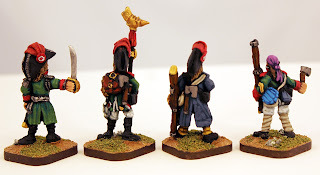 There are eight different poses of Tuscani Elves dressed in Condottierie uniform with bicorne and these are an Officer, a Standard Bearer, Musician, Sergeant and four different Troopers. We repeat the trooper poses in the unit pack. 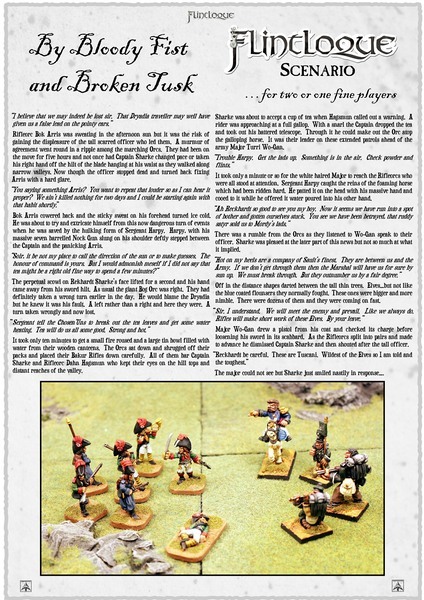 These miniatures are supplied with separate campaigning back packs (code BS29) which can be attached (as shown in the pictures) or left off. You can choose from a unit pack or single trooper booster. 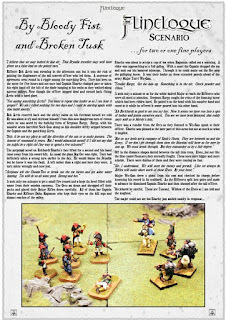 Choose from Unpainted with Bases or Painted and Based. Sculpted by Elton Waters and studio set painted by Mark Taylor. Go HERE. This great set is fantastic for any 28mm miniature which is out in the field in the time of Horse and Musket. Six different campaigning back packs each with its own features such as tied on sacks and bags, lengths of rope, food items, hatchet and short axe. Recessed in the rear to fit onto great coats and other uniform details. They can also be placed on bases or in dioramas as part of a terrain piece for extra interest. Choose from the set or select any single pack in any quantity. Go HERE. We have a great many 'Bits and Sprues' in the range including Pies, Tankards, Feathers, Fruit, Tools, Drum and Standard and many more. We have two different free resources for the Tuscani. 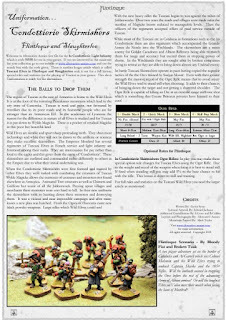 A three page article expanding from the books 5025 War in Catalucia and 5030 Slaughterloo a resource giving you a history, character profile, game statistics and tables for Flintloque and Slaughterloo plus uniform and accounts of line and light infantry. Click HERE to download. 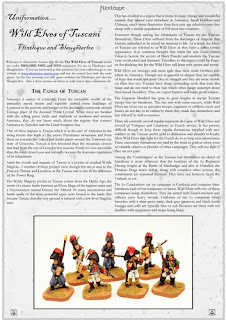 Also a one page article on the Tuscani Skirmishers with story and optional rule. Click HERE to download. Enjoy! A stand alone full scenario which features some famous characters. 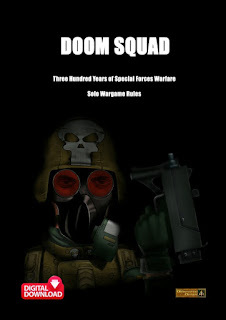 It makes use of several free files and also the 5025 War in Catalucia game book. This is a set piece scenario which can go very differently each time it is played. You will need the four page insert for 5109 Sharkes Chosen for the character profiles it contains. Also the Tuscani Wild Elf Uniformation insert for the game statistics it contains. These are linked in the scenario three page PDF. Will Sharke escape the ambush or fall to Wild Elf skill? The scenario can also be expanded or played with two players. CLICK HERE to download it from our website hosting. 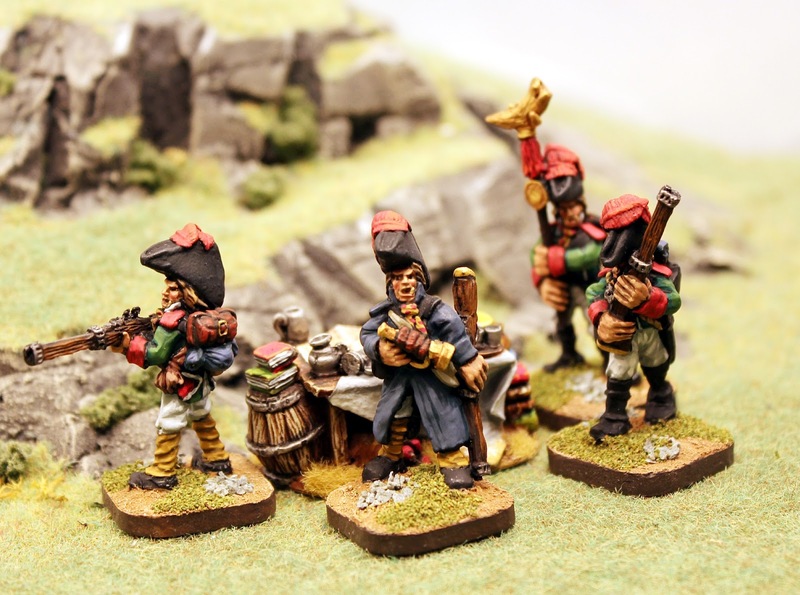 We hope you like these new miniatures with their big guns and also the free resources. 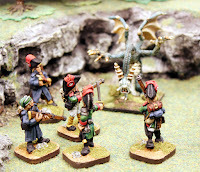 I am thinking on writing a scenario which features the newly recruited and trained Wild Elf skirmishers going up against a Jabberwock or two in a Wylde Magicke game of firelock against claws. We will see what happens but if you would like to see this scenario happen or just want to ask a question drop me a line on sales@alternative-armies.com or visit our Facebook Group.